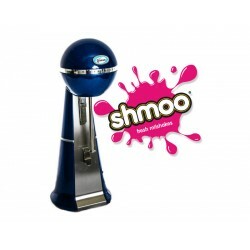 £80 OFF WHEN YOU PURCHASE THIS WITH A SHMOO STARTER KIT. ‘It’s so easy and so quick to mix a Shmoo!'. Simply pour ice cold milk into your milkshake cup, add a scoop of Shmoo milkshake mix then place onto the blender and mix for 15 seconds for great results. Commercial quality milkshake machine punching above its weight for such a small machine (18cm dia x 48cm tall). A stylish-looking gadget with a super quiet mixing action, negligible running costs, no wastage, no washing up, no maintenance and a 12 month replacement guarantee.